One Year Blogging Anniversary and some Highlights of the Past Year! Anyway, I’m really glad I had the opportunity to visit so many places this past year, and I hope you’ve enjoyed reading about some of my adventures. I also really enjoyed getting to explore parts of London I hadn’t spent much time in before, and uncovering some hidden gems. I visited a tonne of great places, but some of the ones I really loved, and would recommend are: the Under the Pier show in Suffolk, the FDR Presidential Library and Museum in New York, the Museum of Everyday Life in Vermont, the Hans Christian Andersen Museum in Denmark, Dr. Guislain’s Museum in Belgium, and Crossness Pumping Station in London. Of course, the most popular posts on my blog aren’t necessarily my favourite places (though some of them are), but I thought I’d link to some of them here for newer readers who might be interested. My most popular post BY FAR (seriously, it has over 3 times as many hits as the runner-up) is the Arnold Schwarzenegger Museum in Thal, Austria. I mean, I can see why; people love Arnie, and they had some great waxworks of him that I had a blast posing with. Number 2 is Lake Bled in Slovenia, which was unbelievably gorgeous, and the dry toboggan run was definitely a highlight! I wasn’t that enamoured with the Styrian Armoury in Graz after visiting it, but I think loads of people are interested in it (like I was, before I went there), judging by how many searches I get. Finally, Mansfield Reformatory and Eyam Plague Village are two of my favourite creepy destinations, so I’m happy to see that other people seem to like them too! Thanks to everyone for reading! I hope I can continue to gain new followers in the coming year, and entertain those of you who’ve stuck around! 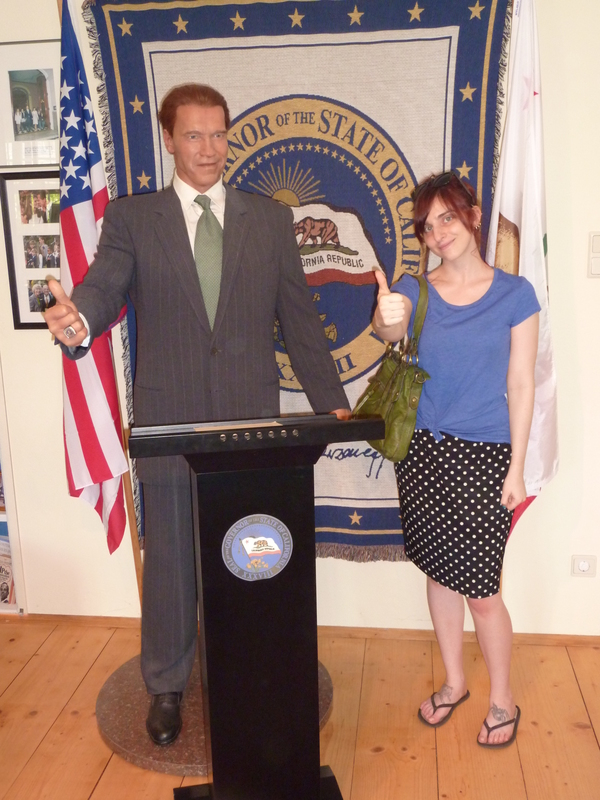 Me and Arnie are giving you all a big thumbs up!